For decades the Silverdale Rotary Club has maintained strong ties with the Central Kitsap School District (CKSD), and during the past 11 years the Silverdale Rotary Club has teamed with the East Bremerton Rotary Club to deliver American Heritage hard cover dictionaries to every 3rd grader in all 12 elementary schools in the CKSD. That's over 9,000 dictionaries! Each Club covers six schools. 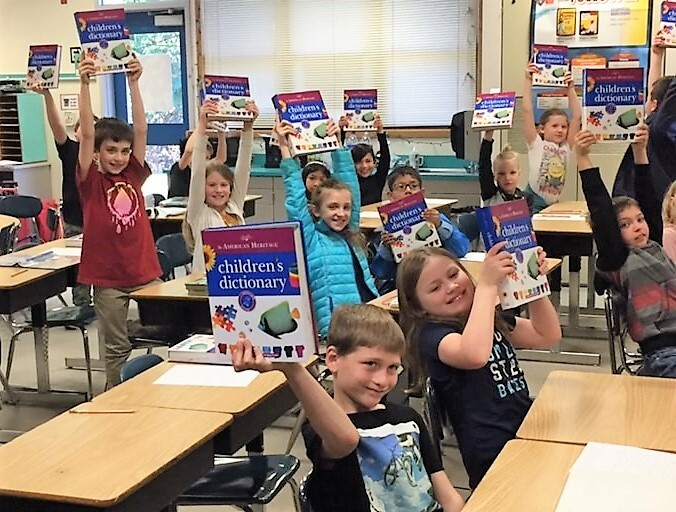 Thanks to our generous sponsors and the community who purchased Duck Tickets for the 2018 Silverdale Rotary Duck Race, our Club purchased and delivered over 400 dictionaries this year to eager 3rd graders and grateful staff. Rotarians immensely enjoy passing out the books and interacting with the students, explaining about Rotary, and briefly exploring the dictionaries. In the video below, Rotarian Kim Peterson and the students read and understand the Rotary Four Way Test on the label on the inside covers. 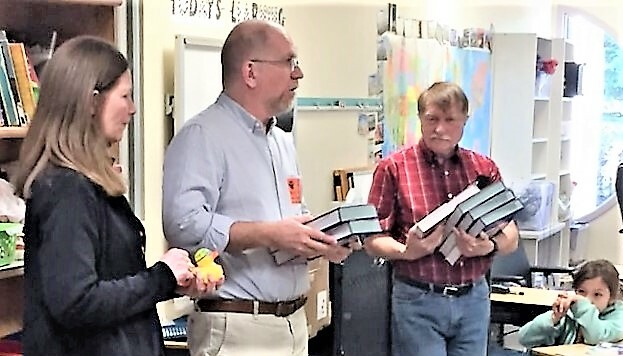 Rotarian Erin Shannon, whose son is in 3rd grade at Silver Ridge Elementary, was in his classroom doing the presentation and gave him his very own dictionary! Our point exactly - that says it all!